Book News: Note That Helped Put Kerouac 'On The Road' Is Now On The Block : The Two-Way Once thought lost to a watery grave, Neal Cassady's letter to Jack Kerouac, which inspired On the Road, has resurfaced and will be sold Dec. 17. Also: Daniel Handler delivers on his $110,000 apology. Jack Kerouac's On the Road, a draft of which is seen here, may never have taken the rambling form it did, had he not seen a letter similarly styled by his friend Neal Cassady. For more than six decades, the heart of a Beat literature classic had been thought lost, dropped overboard a houseboat. Turns out, the letter that helped inspire Jack Kerouac's On the Road has now reportedly resurfaced — not from the sea, but from an unopened envelope buried in a defunct publisher's office. The Associated Press reports that the letter, an 18-page free-for-all narrating a visit to Denver, was written to Kerouac by his friend — and inspiration for Dean Moriarty in On the Road -- Neal Cassady. 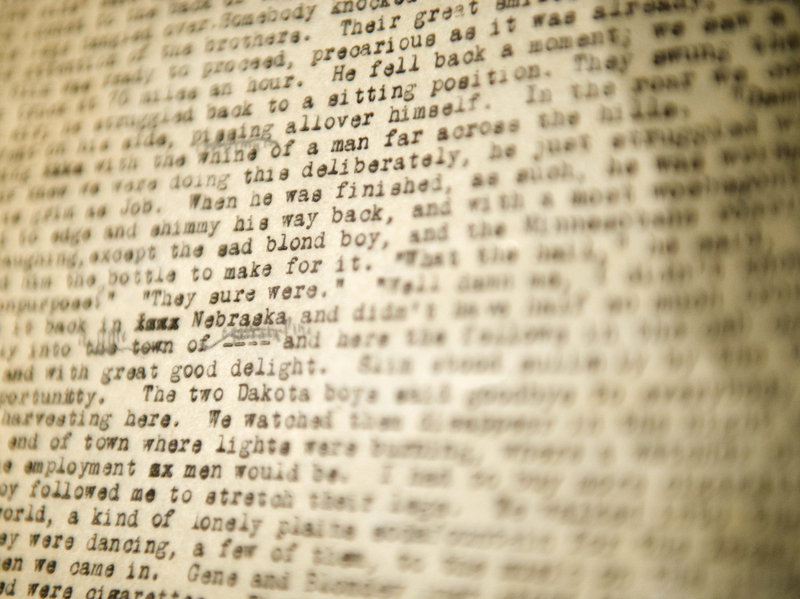 When Kerouac read it, he abandoned an early draft of the book and modeled a new one on the style of the letter. In a 1968 interview featured in The Paris Review, and noted by the AP, Kerouac raved about the letter's contents. "It was the greatest piece of writing I ever saw, better'n anybody in America, or at least enough to make Melville, Twain, Dreiser, Wolfe, I dunno who, spin in their graves." Fellow friend and Beat great Allen Ginsberg had supposedly lent the letter to a friend, who in turn had let it meet a watery end. Instead, Ginsberg apparently tried to get it published by sending it to a San Francisco press, where it languished for years until the publisher's closure. The auction house Profiles in History will put the letter on the block Dec. 17. Lemony Snicket Keeps His Word: In contrition for jokes he made at the National Book Awards, Daniel Handler — the writer behind Lemony Snicket — added to his apology Friday. On Twitter, Handler called his remarks "monstrously inappropriate and yes, racist." "It would be heartbreaking for the #NBAwards conversation to focus on my behaviour instead of great books," Handler added. "So can we do this? Let's donate to #WeNeedDiverseBooks to #CelebrateJackie. I'm in for $10,000, and matching your money for 24 hours up to $100,000. Brown Girl Dreaming is an amazing novel and we need more voices like Jacqueline Woodson." On Monday, the We Need Diverse Books campaign confirmed not only that donations had hit the $100,000 threshold, but also that Daniel Handler plans to match it with a check for the full $110,000. McBride Picks Up Faber: Awards season rolls on — and so too does Irish novelist Eimear McBride, whose debut A Girl Is a Half-Formed Thing has won the Geoffrey Faber Prize. The award, now entering its 50th year, marks just the latest prestigious win for McBride's book, which has already collected the 2013 Goldsmiths Prize and this year's Baileys Women's Prize for Fiction, among others. Apple Settlement Stands: A federal judge has green-lit a $450 million settlement reached between Apple, consumers and consumers' lawyers over the company's handling of e-book prices. The settlement was born of charges that Apple had conspired with publishers to raise those prices. The approval was handed down Friday, though The New York Times notes that the final numbers depend on an appeals court ruling in a similar case. That ruling, whose appeal will be heard Dec. 15, found that Apple violated antitrust law by leading a price-fixing operation with the "Big Five" publishers — Simon & Schuster, HarperCollins, Hachette, Penguin and Macmillan. Australian documentary filmmaker John Safran turns to text, telling the story of a white supremacist killed by a young black man in Mississippi. As Safran tells NPR's Rachel Martin, the act of writing the book quickly complicated the very story he set out to tell in the first place. "It started just getting messier and messier, I guess," Safran said of his investigations. "And because this was my first book, I didn't quite work out at that point that messiness is good."